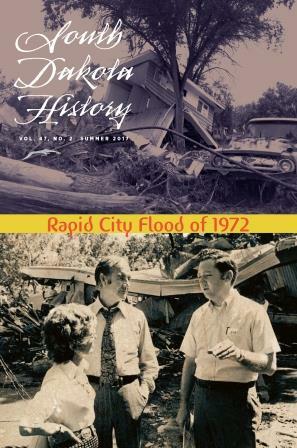 Rapid City’s mayor during the flood of 1972 recalls the disaster that killed 238 people in a memoir published in the Summer 2017 issue of “South Dakota History,” the quarterly journal of the South Dakota State Historical Society. This summer marks the 45th anniversary of the flood. Donald V. Barnett was the youngest mayor in Rapid City history and the youngest mayor in the country when elected in 1971. He had not yet turned 29 when heavy rains devastated the city and a four-county area on the night of June 9, 1972. In his memoir, “Never Again: The Rapid City Flood of 1972 and a Vision for Change,” Barnett gives a dramatic account of the rescue and relief efforts he helped to spearhead. He also recalls the growing consensus among planners and elected officials that the city would have to change the way it used its urban floodplain in order to prevent a similar disaster in the future. The entire summer issue of “South Dakota History” is devoted to Barnett’s memoir and to a “Dakota Images” profile of Maj. Gen. Duane L. “Duke” Corning, the adjutant general for the South Dakota National Guard from 1963-83. Corning was a key figure in the flood response and recovery.